Flowers that look like daisies belong to the same family as daisies, the Asteraceae, or aster, family. The flowers may look like daisies, but there are subtle differences in the shape or amount of petals, the color of the central disk, scent of the flowers and the leaves and the shape and color of the leaves. Daisy or daisy-like, the members of the aster family make a pleasing addition to any landscape. Heart-leaf leopardbane (Arnica cordifolia) is also known as Heartleaf arnica. The plant features heart-shaped leaves on long stems growing at the base and stems from 8 to 20 inches tall, each one with a single flower with light yellow petals and a dark yellow center disk. Flowers bloom from May through August. The root, a rhizome, sends out shoots to form a clump of leaves and flowers several feet wide. Heart-leaf leopardbane is native west of the Mississippi from Canada's southern border of the United States. Plant in partial shade and a soil that is moist to dry. Desert marigold (Baileya multiradiata) is also known as showy desert marigold, paper daisy and desert baileya. The plant grows from 12 to 18 inches tall. Flowers with double-rows of bright yellow petals around a darker ring and a light center disk grow from 1 to 2 inches across. Leaves are gray-green and grow at the base of the plant. 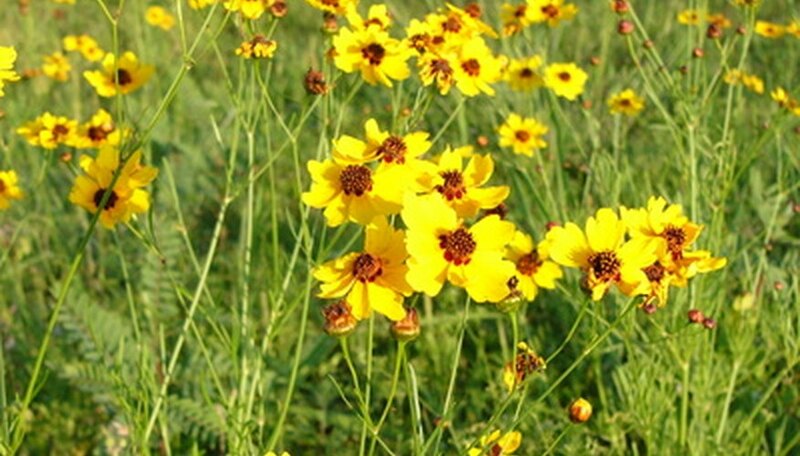 Desert marigold is native to the desert areas of the southwest. Flowers bloom from March through November and the plant likes partial shade and a dry soil. Bees and butterflies will come by for the nectar. Arrowleaf balsamroot (Balsamorhiza sagittata) features silver, arrowhead or heart-shaped leaves 12 inches long and 6 inches wide at the base of the plant. Flower stems grow from 8 to 24 inches tall with one flower each. The flowers measure up to 4 inches across, have yellow-green petals and a yellow center and bloom in May, June and July. Arrowleaf balsamroot is found west of the Mississippi and likes full sun and a moist, sandy or gravel soil. Chocolate flower (Berlandiera lyrata) is also known as chocolate daisy, lyreleaf greeneyes and green-eyed lyre leaf. The plant grows from 1 to 2 feet tall. The gray-green, velvety leaves have the scent of chocolate. Daisy-like flowers measure 2 inches across with yellow petals and a maroon center disk. The flowers bloom from April to November. It is found in Arizona, Colorado, Kansas, New Mexico, Oklahoma and Texas and likes full sun or partial shade and a moist soil and is resistant to deer damage.